HOW BAD IS FAST FOOD FOR YOUR HEALTH? Home/Blogs/HOW BAD IS FAST FOOD FOR YOUR HEALTH? Food makes us who we are. If we talk about physical strength, presence of mind, our height, weight etc all these things depend on the type of food we eat. Food provides us nutrients, vitamins and minerals which are required for our growth and wellbeing. Sadly, not all food is good for us and for our health. The foods that are not good for our health are fast foods or junk foods (generally fried food). Most fried foods are processed food; thus are not in their natural state. Fried food is generally high in calories. 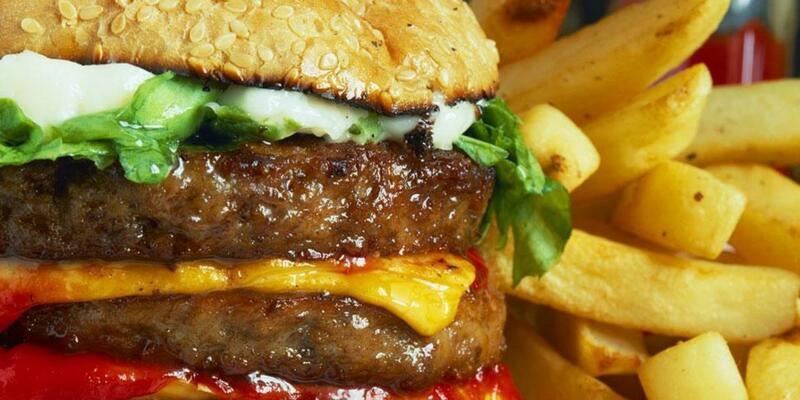 An unhealthy fried patty burger, alone, contains over 1,200 calories. Eating food high in calories will increase your risk of being obese as your body will use the desired number of calories (energy) for work and then it will store the excessive calories as fat making you obese. Here is a list of top reasons why fast food is bad for health. Fast food is notoriously high in sodium. Your kidneys rid your body of salts, but consuming too much salt causes it to build up in your system. This forces your heart and kidneys to work harder. According to the American Heart Association (AHA), excess sodium may lead to a wide range of serious medical problems from high blood pressure and heart disease, to kidney stones and osteoporosis. Perhaps the most concerning substance in fast food is trans-fat. Trans-fats are created when hydrogen is added to liquid oils so they stay solid at room temperature. The resulting fat is considered by the AHA to be one of the most deadly things you can consume. A diet high in trans-fats greatly ups your risk of type 2 diabetes, heart attack, and stroke. While most people know about the high fructose corn syrup in soft drinks, sugar is also abundant in fast food. Many burgers, chicken sandwiches, and breakfast items contain added sugar. Some foods marketed as healthier fare are also high in sugar. For example, McDonald’s Fruit and Yogurt parfait, while low in calories and fat, contains 23 sugar grams. Eating too much sugar increases your risk of weight gain and metabolic syndrome. Despite its high caloric content, fast food offers very little nutritional value in return. One fast food meal can contain as much as 1,500 calories, which is well over 50% of the daily calories required for a healthy adult. A Big Mac from McDonalds contains 563 calories, 33 grams of fat, and over 1,000 grams of sodium. Add fries and a soda, and you’ve almost reached your dietary limits for the entire day in just one meal. Consistently eating too much sugar, fat, empty calories, and sodium will likely cause weight gain. While some people claim eating too many carbs or too much fat is the primary reason for weight gain, it’s not. The main reason you gain weight is that you eat more calories than you burn. Since most fast food is high in calories, you must limit how much you eat or choose healthier options, such as salads with low-calorie and fat-free dressing or a small veggie sub on whole grain bread without mayo in order to limit your risk of weight gain. Fast food is notoriously hard on your digestive system. Those who eat a poor diet are more likely to experience stomach upset and digestive problems. Conditions, such as acid reflux, gastroesophageal reflux disease (GERD), and irritable bowel syndrome (IBS) may develop or worsen in those that consistently eat fast food. According to WebMD, eating spicy foods, large meals, high-fat or greasy foods, and caffeinated drinks and sodas are common heartburn triggers. According to the Centers for Disease Control and Prevention, approximately 9.4 million people suffer from foodborne illnesses each year. While fast food isn’t responsible for all cases, it is known for causing food poisoning. An NBC Dateline undercover investigation found many popular fast food restaurants had hundreds of food safety critical violations ranging from improper food holding temperatures and rodents to bare hands food contact and inadequate sanitation. When you cook at home, you control the ingredients. When you eat fast food, you usually ingest the main protein, such as ground beef or chicken breast, as well as preservatives, artificial colors, and artificial flavors. In addition, meat quality may be questionable. According to Friends of the Earth Chain Reaction II report, many fast food restaurants scored an “F” for their company policy on antibiotic use in meat and their transparency about antibiotic use. When it comes to eating fast food, it’s often a buyer beware situation. When you eat empty calories, you’re offsetting the good food you could be eating in its place. For example, instead of fried chicken nuggets and an order of large fries, you could have something more nutritious, such as a grilled chicken breast or grilled fish and baked potato, which is a healthier meal since it’s low in trans-fat, added sugar, and sodium. Add a green salad, and you’ve got a well-balanced meal that tastes great. You don’t have to give up fast food altogether. An occasional fast food meal probably won’t derail your health. However, if you eat fast food more often than not, you may want to re-evaluate your diet and try to cook at home more.